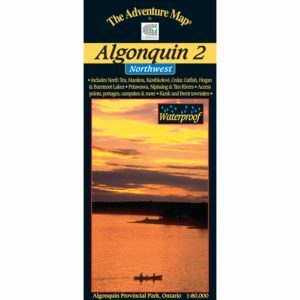 This map shows the less-well-known southern portion of Temagami, which makes it a great paddling location for those hoping to avoid the summer congestion of Lake Temagami to the north. And it is every bit as worth visiting. 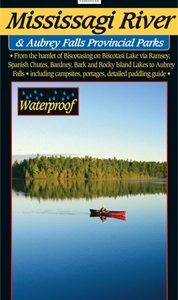 Lots of fine paddling lakes here, and Marten River Provincial Park smack dab in the centre of it all – a great base of operations for your trip. In addition to great campsites and other conveniences, the park has a replica Logging Camp that will take you back to the old days. Most of east half of the map covers the Nipissing Game Preserve where a noticeable abundance of wild animals can be seen – no hunting or trapping is allowed there. 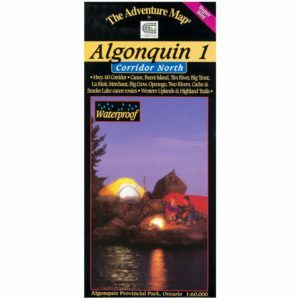 This map includes the area from the west tip of Wicksteed Lake and the railway to the east, Jumping Caribou Lake to the north, Cross Lake and the northern part of Temagami River to the west, and Red Cedar Lake to the south. 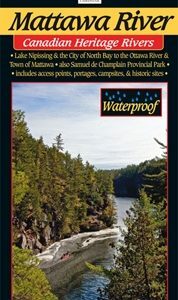 We also show the southern Temagami River – a popular whitewater route – on the back side.